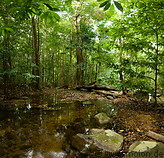 The Tanjung Datu national park has some pristine unpolluted rainforest probably because the park is very far away from urban areas, can only be reached by boat and receives very few visitors. There are a few well-marked trails which criss-cross the park and a few creeks which flow down from the hills. Supposedly there is some wildlife in the park, although during my brief visit I didn't meet any. In the park there are rafflesia flowers in one spot, of a different species than the ones found in the Gunung Gading national park.